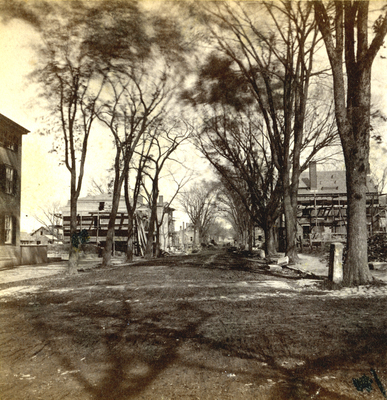 "Cumberland, from Pearl Street, Looking Northeast." Cumberland Avenue, viewed from Pearl Street, looking northeast. Southeastern corner of Cumberland Avenue and Pearl Street at right. "Cumberland, from Pearl Street, Looking Northeast." (1866). The Great Fire : 1866 - Stereoscopic views. 29. Portland, Me., Great Fire, Portland, Me., 1866, East End, Munjoy Hill, Cumberland Avenue.